Figured it would align well with the intention here! The White Salmon River runs down the slopes of the Columbia River gorge and is famous in whitewater circles for being consistently runnable throughout the year. It is a river on which I have started to learn the craft of river running myself, and last winter, a river on which I had one of the most unique experiences of my life. I went down to Hood River expecting to run some rivers. It is a typical activity of the area, itself being a mecca of rafting and kayaking, among other things. The day before our trip to the White Salmon was sunny, but cold. The Pacific Northwest doesn’t usually get so chilly, especially in November. Even in the sun, temps dropped into the high 20s. We ran the Klickitat, a mostly mellow class II run with one class III mixed in. I was running it in my beat-up, leaky Dagger Nomad. I swam a couple of times, and tore my drysuit the second time. It was a cold day, but despite being shivering and chilled I miraculously made it through the rowdy class III wave train that Sean, my friend and local river guide, dubbed “Ishy Pishy”. I learned more about kayaking in stronger rivers, and despite the cold and the swims, had a pretty darn good time. The next day we were undecided on what to do. Mt. Hood was only an hour away, and imminently tour-able with the incoming snow storm. I had my skis and was ready to go, but we also had the unique opportunity to run the Lowest section of the White Salmon, a stretch of river that has only been runnable since the removal of the Condit Dam in 2011. Since then, it has snowed only a handful of times in the gorge. 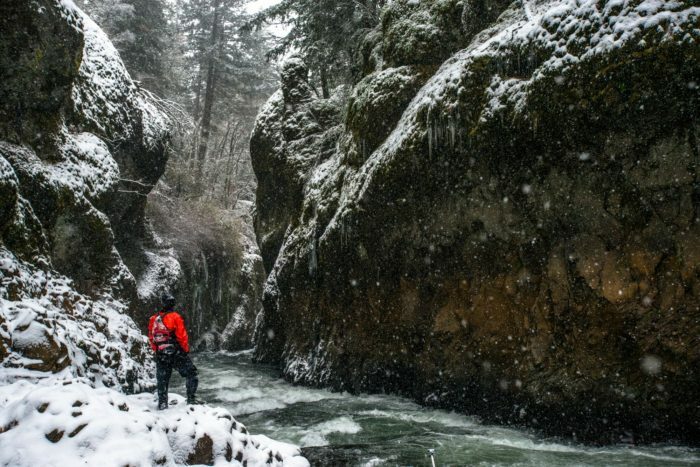 Sean and I jumped on the chance to run the newly freed river through it’s own small, yet spectacular narrows, in a unique, snow-caked condition that few have ever likely experienced. One thing was almost certain: we would have the river to ourselves. The Lower-Lower section of the White Salmon runs through a series of class II and III drops along its path, some with wood lodged in them. We opted to raft it as a pair due to a tricky portage around one Class V that, if I missed the eddies above, or if either of us botched our line through it in a kayak, could have turned into a very dangerous situation very quickly. The raft was also warmer, and our hands would stay out of the ice-cold water for the most part. With a liter of hot cocoa and freezing fingers we jumped in the boat and hit the river. The snow was coming down hard, and truly, didn’t let up all day. We floated past the old Condit dam site and the twisted volcanic rocks in the valley that surrounded it. We paddled through a series of rapids, which we navigated all with relative ease. Sean had run this section of the river many times since its liberation and was very familiar with it. Our hands, that had been going numb, warmed up considerably as we worked hard, moving quickly downstream, and they stayed surprisingly toasty even though we didn’t have gloves on. Steelhead Falls is a single class V drop with a nasty, recirculating hydraulic that can easily trap boaters. With safety, in warmer weather, it can be run, and people who take a swim can be fished out by those on the nearby shore. But we were solo, so we portaged it. Sean paddled the tricky entry rapid down to a lower eddy above the falls after letting me off on the bank. The snow on top of the rocks near the river made the portage itself very tricky, and even with some rope to hold onto through a narrow section by the falls itself, making it through zones of waist deep water with small islands of snowy, super-slick rock without losing my footing was a heart-pounding experience. I knew that if I went over the falls that I would be in trouble if Sean couldn’t reach me quickly, and of all the extreme environments I have put myself in, rivers scare me the most. The fear was only temporary though. We both made it to the other side of the falls without any incident to gaze down the White Salmon Narrows, a truly svelte canyon with volcanic flow rock typical to the Columbia River Gorge, crowned in evergreens and moss, rising up on each side. It was beautiful, and quiet, aside from the river running beside us. Icicles dangled from the jagged stone walls, and snow rested on tiny pockets of rock on any upward facing slice of cliff. I had never before been anywhere quite like it, and we were about to plunge down into it alone. The Narrows run fast and wild. Once you drop in from Steelhead or the eddy below it, you are committed. They have been known to jam with wood, especially after rain storms, and have no escape except to keep moving down-river. Thankfully, for us, the only thing the slice in the earth had to offer was stunning beauty and some awesome Class III waves. Below the Narrows the river runs past the old dam powerhouse. “If I could turn that into a brewery I would,” Sean told me, grinning as we floated past it, snow flitting down quietly in cotton-ball flakes all around us. We approached the final few rapids with confidence and flew through them easily. We had done the hard part long before and were just enjoying the ride out, taking a few interesting lines through the last drops as we went, slaloming through rocks and spinning through a couple small eddys. It was a nice lesson in river running and boat control for me, and a good way to keep warm on the more mellow end of our journey. The end of the float was simple. As we sipped on hot cocoa and navigated the shallow rock beds we watched salmon race under our boat, and birds of prey flew overhead, eyeing the very fish below us. The river, wild and free again after nearly 100 years, was full of life. It was my first time, and I was lucky enough to see it in a way that few have since the removal of the Condit Dam. To those who worked to free the White Salmon, thank you. It is truly a spectacular natural treasure of the Columbia Gorge that everyone should make time to experience in some way at least once in their lives.